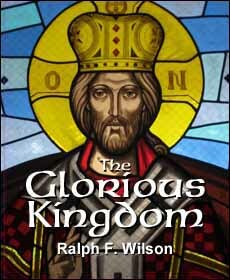 It's easy to say, "Oh, yes, the Kingdom of God must be glorious. Ho hum." The problem is that the concept of the Kingdom of God is pretty nebulous to the modern Christian. And the idea of glory is even fuzzier. Yet, the concepts of Kingdom and glory run throughout the Bible -- especially the New Testament. When you start probing the twin themes of glory and kingdom in Scripture and begin to connect the dots, the implications to the disciple can be life-changing. This Biblical study traces the themes of glory and Kingdom throughout the Bible, from Genesis to Revelation. Chapters focus on glory in the tabernacle in the wilderness, Daniel's prophecy of "a son of man," Jesus' teaching on the Son of Man and the Kingdom of God, how beholding God's glory transforms a believer, how God's glory and authority in a believer are intended to bring the Kingdom to earth, Christ's return in glory, and the final state of glory for the Bride. This book is intended for study as well as instruction, presented in six lessons. Helpful thought and discussion questions make it useful for personal enrichment and by small groups and classes. Extensive research contained in the footnotes makes it a goldmine for teachers and a boon to preachers involved in sermon preparation. All in all, this rich study will challenge Christian believers to rethink and reexamine their Bibles and their way of living. The Glorious Kingdom in the Sinai Desert. We trace God's glory in Moses' encounters with Yahweh and the tabernacle in the midst of the camp with God as King in the midst of his people. This marks the beginning of the theme of the Kingdom of God in the Bible. The Glorious Kingdom of the Son of Man. The prophecy of "a son of man" in Daniel 7:13-14 provides a vital key to understanding Jesus as the Son of Man and heir of the Glorious Kingdom. We consider how Jesus uses the title 'Son of Man' in the Gospels. We Have Seen Jesus' Glory. John 1:14 declares, "We have seen his glory, glory of the only Son from the Father" (ESV). We examine just how Jesus' glory was seen during his earthly ministry -- as well as during his trial and crucifixion. And we observe Jesus' authority while on earth. Transformed by God's Glory. We examine in detail 2 Corinthians 3:18 where Paul teaches that spiritual transformation occurs when we behold Jesus' glory, using the analogy of Moses' face that glowed from being in God's presence. We study how sanctification occurs in us through a fervent hunger to know Jesus fully. Glory in Clay Jars. Now we turn to how God's glory in us is seen by those around us -- and how it changes our world! We study Paul's teaching on glory in suffering, in particular, glory in jars of clay (2 Corinthians 4:7). Then we see our place of Kingdom Authority to rule and reign with Christ in this present age. The Glory and the Kingdom to Come. The study concludes by examining Jesus' teaching of the glorious coming of the Son of Man on the clouds, and the expectation we have of glory as Christ's radiant Bride, who has the privilege of seeing his face. Participant lesson handouts in PDF format can be downloaded and printed for your group or class at no charge. Kindle E-book format, Introductory Price US $7.49, $8.95 You may purchase this version directly from Amazon USA or from national sites below. This is read using a your Kindle or a Kindle Reader program installed on your computer, tablet, or phone. It cannot be printed out (Amazon ASIN: B01MT0BZ07). Amazon USA - Amazon Canada - Amazon UK - Amazon Germany - Amazon France - Amazon Japan - Amazon India - Amazon Australia Available now. PDF E-book format, Introductory Price US $7.49, $8.95. You purchase this PDF e-books and can download it within minutes. You can read it on your computer in PDF format if you like, or print out a single copy on your printer, either 8-1/2 x 11" or A4 paper. To make multiple copies, get reprint licenses below. No tax is charged on e-books. PDF e-books are ordered directly from the author at JesusWalk Publications. Available now. Reprint License, $1.50 per copy. This allows you to print additional copies for your own group. One license is required for each additional copy you make beyond the initial book you purchased. This reprint license prohibits sale of the book to individuals outside your local area or congregation. You'll probably want to order a single copy of the e-book also, so you'll have the text from which to reprint. So if you have a group of 6 people, you'll need to order one e-book (for the first reprint) and 5 reprint licenses.